Fig. 1. Rhopalastrum rossicum** sp. nov., 36. Holotype, x130, sample No 16/2. Santonian. Fig. 2. Rhopalastrum attenuatum sp. nov., p. 37. Holotype, x130, sample No 16/41. Santonian. Fig. 3. Spongodiscus maximus sp. nov., p. 39. Holotype, x130, sample No 8/4. Campanian. Fig. 4. Spongodiscus volgensis sp. nov., p. 38. Holotype, x130, sample No 16/16. Santonian. Fig. 5. Stylotrochus hexacanthus sp. nov., p. 40. Holotype, x130, sample No 8/9. Campanian. Fig. 6. Stylotrochus dolichacanthus sp. nov., p. 40. Holotype, x130, sample No 28/2. Turonian? Fig. 7. Stylotrochus octacanthus sp. nov., p. 40. Holotype, x130, sample No 16/36. Santonian. Fig. 8. 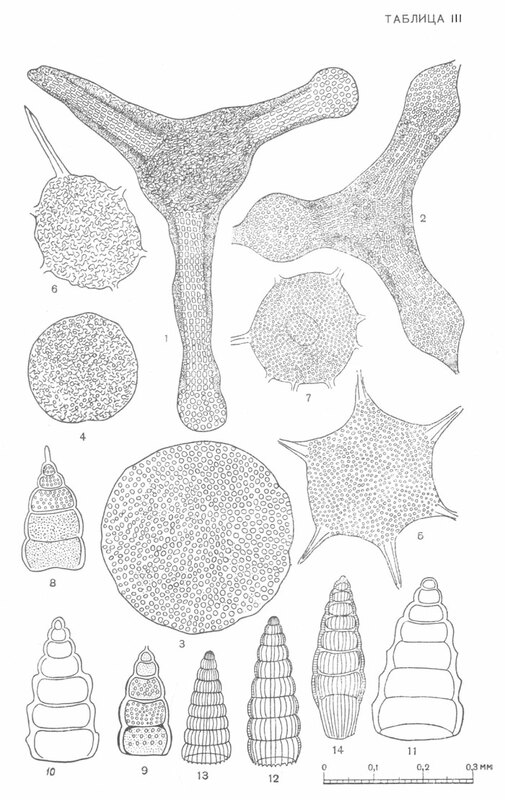 Lithostrobus turritella sp. nov., p. 41. Holotype, x130, sample No 8/5. Campanian. Fig. 9. Lithostrobus turritella sp. nov., p. 41. x130, sample No 8/15. Campanian. Fig. 10. Dictyomitra scolaris sp. nov., p. 42. Holotype, x130, sample No 16/4. Santonian. Fig. 11. Dictyomitra gigantea sp. nov., p. 42. Holotype, x130, sample No 16/45. Santonian. Fig. 12. Dictyomitra striata sp. nov., p. 41. Holotype, x130, sample No 8/8. Campanian. Fig. 13. Dictyomitra striata sp. nov., p. 41. x130, sample No 16/5. Santonian. Fig. 14. Dictyomitra striata sp. nov., p. 41. x130, sample No 8/15. Campanian. ** This name, i.e. "rossicum", was given by R. Lipman later in 1968 (Lipman, R.Kh., 1968. Renaming of two Late Cretaceous radiolarian species. Paleontologic Journal. Moscow. No 3. p. 102. In Russian). Firstly in the regarding publication (Lipman, 1952) this species was named as "ingens".